Yosemite National Park Upper and Lower Falls viewed from the forest floor. The famous naturalist John Muir was angry. He had lost a major battle protecting Yosemite National Park, the land he had loved for over 30 years. As founder of the Sierra Club, Muir had battled against the railroad industry wanting to install tracks through Yosemite, sheep herders wanting to graze every piece of greenery, lumber companies wanting to cut down the redwoods, miners digging for minerals and land grabbing settlers. All of these he fought and defeated, but he couldn’t beat the Federal Government. 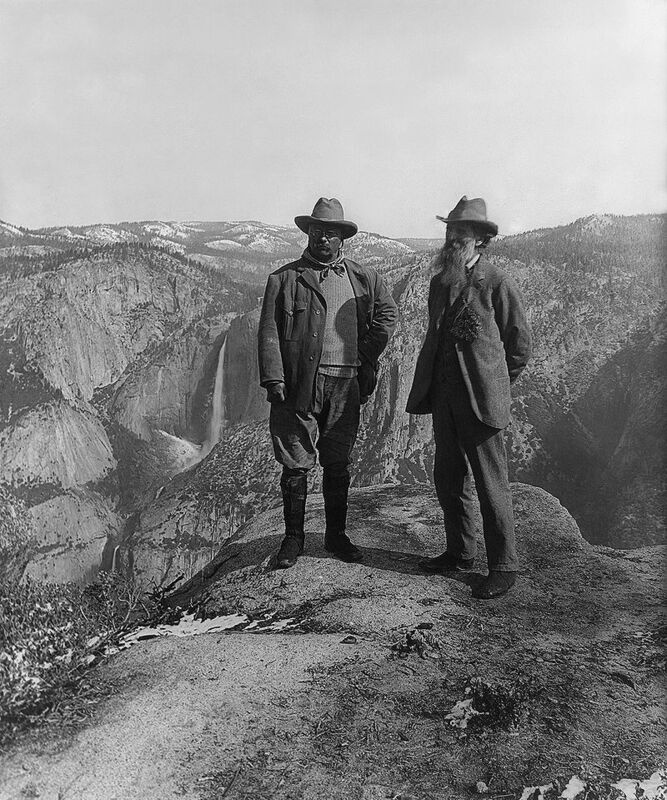 The Government that was supposed to protect Yosemite had let John Muir down. If you’ve been to Yosemite National Park in the Sierra Mountains of California, it is likely you have visited the Yosemite Valley, where Bridal Vail Falls, the Half Dome and the glorious Awahnee Hotel are familiar landmarks. 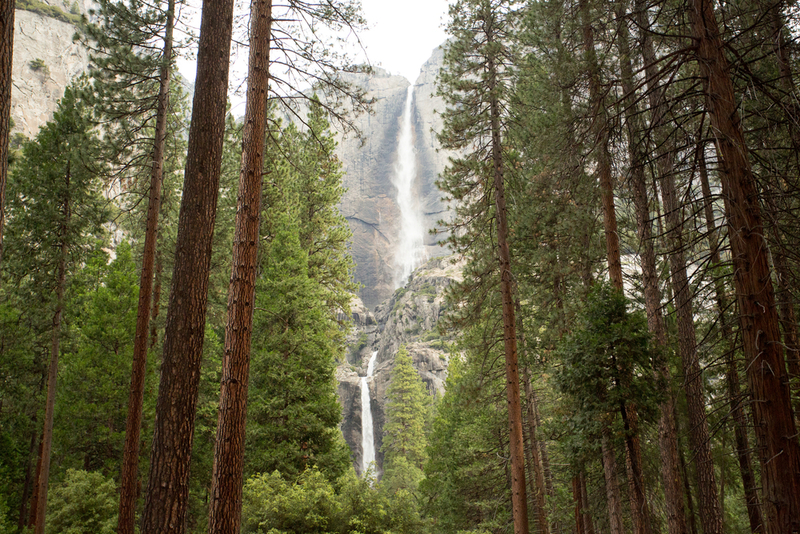 But you have not hiked through a second valley, which some consider more beautiful than Yosemite Valley. It is the Hetch Hetchy Valley, and you haven’t walked through it because you can’t. 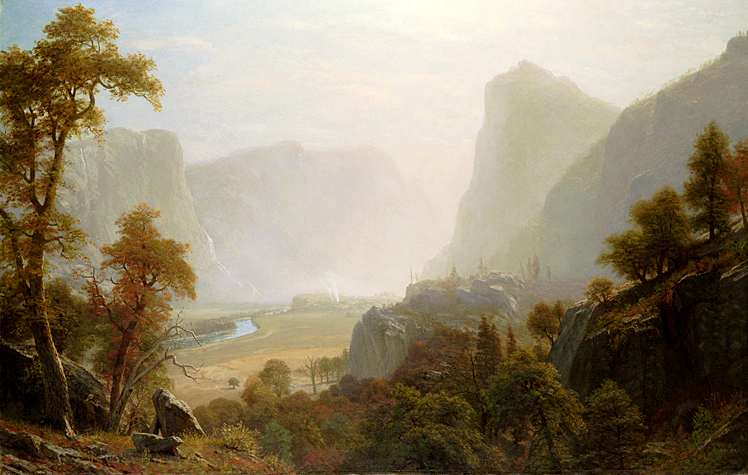 Oil Painting of the Hetch Hetchy Valley in the late 1800’s by artist Albert Bierstadt before the valley was flooded. This beautiful valley is buried under 300 feet of water. Experts believe the name Hetch Hetchy may have come from the Miwok people’s word hatchhatchie, meaning “edible grass.” Those grasses are all under water now. The Hetch Hetchy Valley was Muir’s last great battle and he lost. 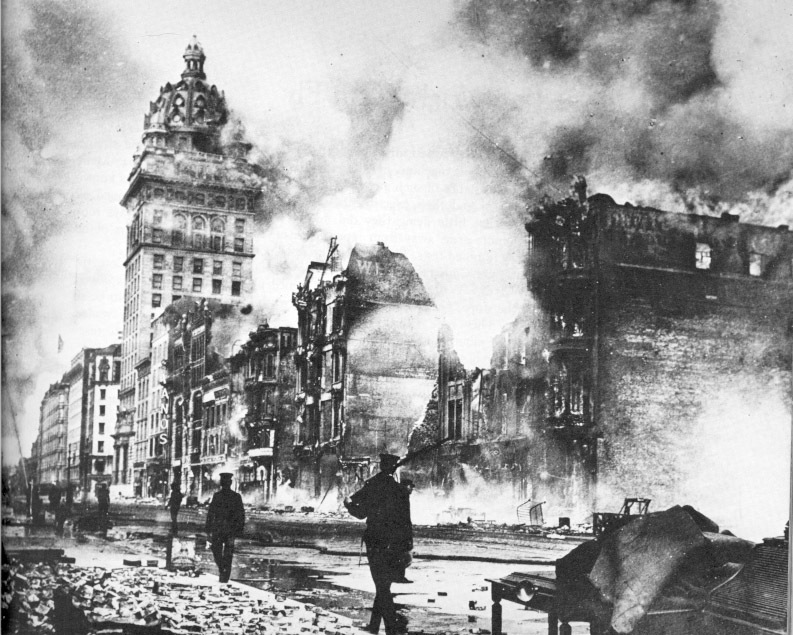 The battle began in 1906 after the tragic San Francisco Earthquake. Fire raged throughout the City, pointing out the inadequacy of the City’s water system. Something had to be done to bring greater water supplies to San Francisco. The snowmelt of the high Sierra was an obvious choice for fresh water. Los Angeles had tapped the east side of the Sierra for an impressive aqueduct from Owens Valley to the San Fernando Valley. A similar arrangement on the west side was conceived of for San Francisco. The Tuolumne River peacefully curves through the beautiful Hetch Hetchy Valley in this photo, taken before the valley was flooded and turned into a reservoir. The Sierra snowmelt flows down through the Tuolumne River, through the Grand Canyon of the Yosemite, into the Hetch Hetchy Valley and then down into Lake Don Pedro. The San Francisco water plan would dam the Hetch Hetchy Valley and create a huge lake, completely covering the valley floor, to control the water flow to Lake Don Pedro. Then, at Lake Don Pedro, a 150-mile long Aqueduct was proposed to carry the water to San Francisco. Yosemite lands are Federal lands, requiring permission from the Federal government to construct a dam. 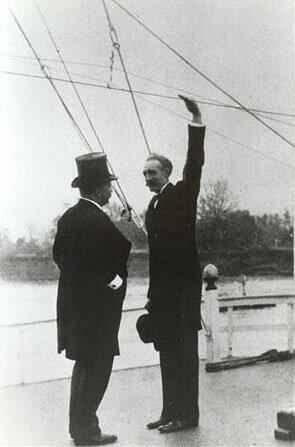 That permission eventually came after San Francisco acquired a curious ally: his name was Gifford Pinchot and, other than his involvement with Hetch Hetchy, he is considered a national environmental hero. When Gifford Pinchot joined Theodore Roosevelt’s government as the first Chief Forester, Yellowstone was the only national park in the United States. It was Pinchot, who worked with President Roosevelt to set aside and protect such unusual and historic lands as: The Grand Canyon, Arizona; Crater Lake, Oregon; Wind Cave, South Dakota; Mesa Verde, Colorado; Devils Tower, Wyoming; El Morro, New Mexico, etc.…..you get the idea. As the Government took over these lands, they were already being exploited for commercial purposes. The Government action preserved them by placing them under Federal regulation. Pinchot saw the issue as one of a limited number of people viewing the beauty of the Hetch Hetchy versus the millions of people, who would benefit from a plentiful water supply. Pinchot has been criticized for his definition of Conservation. 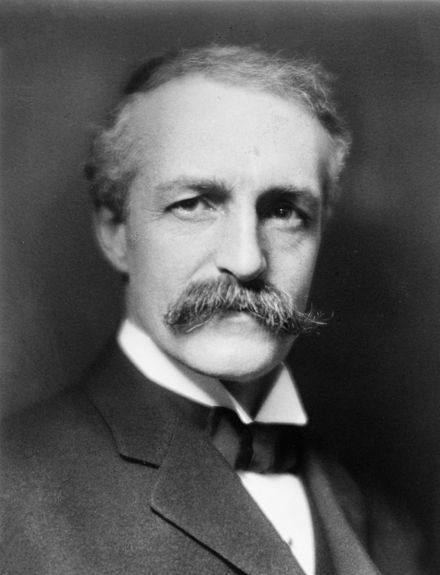 However, during the Roosevelt Administration, it was Gifford Pinchot, who stood guarding the gate, protecting American public lands from being mercilessly exploited by lumber barons and mining interests. And that is why he was fired from his job when Theodore Roosevelt left office and the William Howard Taft administration came to power. It is possible that Pinchot’s position on San Francisco’s water supply might have been colored by something else – the deadliest fire in American history, known as the Big Burn. 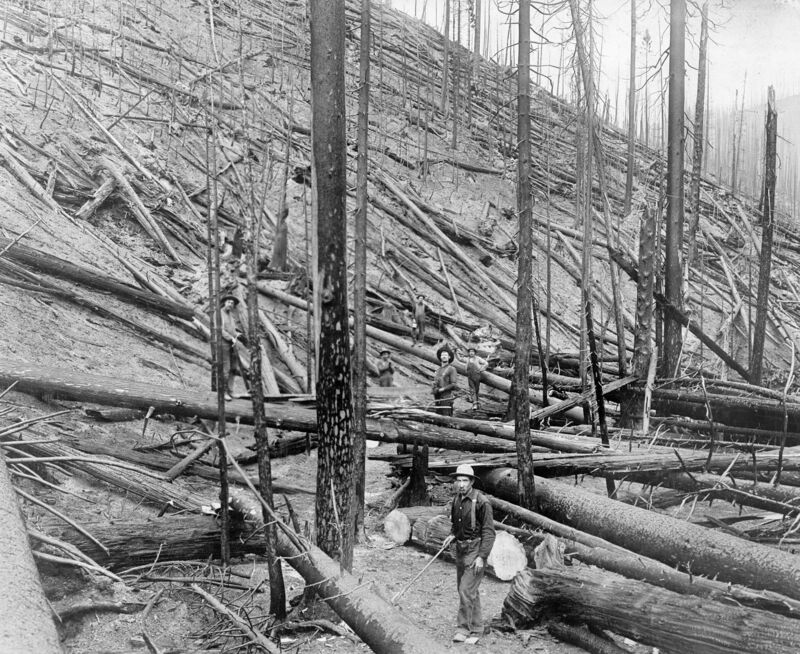 In August of 1910, three million acres of beautiful, protected American forests were destroyed over a huge area, encompassing parts of Washington State, Montana and Idaho, an area equal in size to the state of Connecticut. Pinchot had been instrumental in setting aside this forest land for preservation. 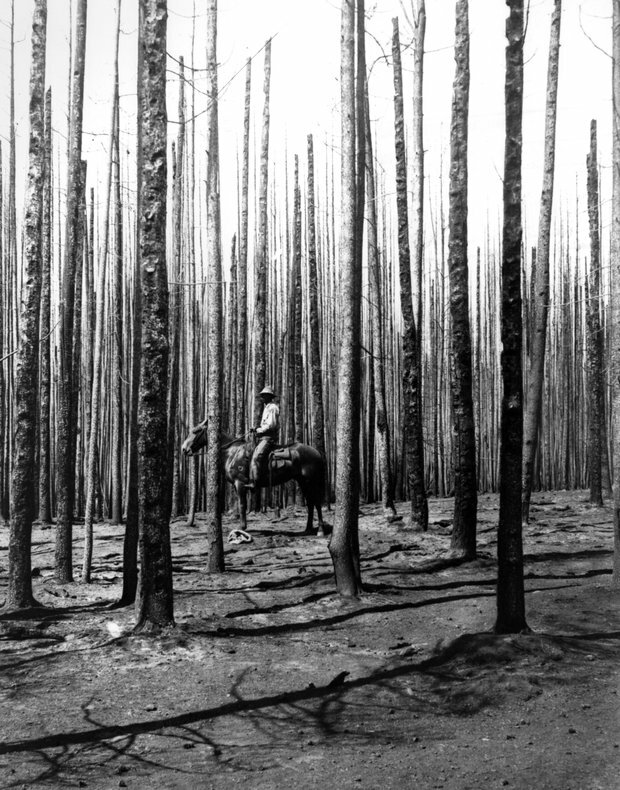 Pinchot must have been devastated by the loss of these forests he had worked so hard to preserve. He could not help but be sympathetic to the plight of San Francisco after its devastating fire of 1906. And so the Hetch Hetchy Valley was flooded with water, backed up behind the O’Shaughnessy Dam, completed in 1923, and feeding San Francisco water so pure it does not require filtration. 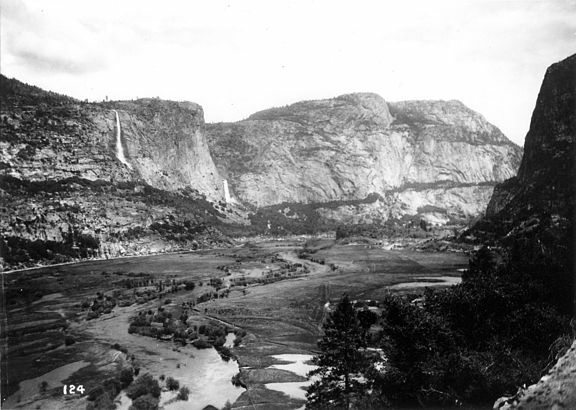 But a long time has passed since the flooding of the Hetch Hetchy Valley. 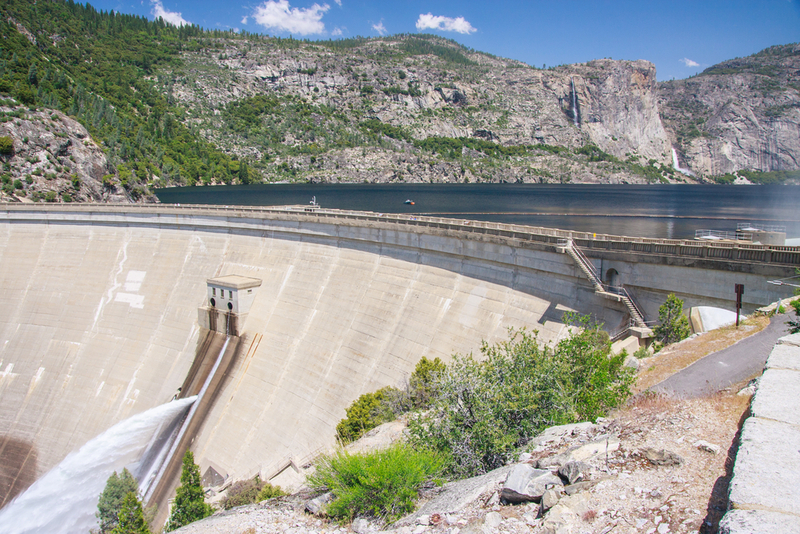 Recently, there has been a movement to drain the Hetch Hetchy and restore the Valley to its previous natural state. Alternative water systems have been found. If the dam were torn down, the National Park Service estimates that in 50 years, with good management, the valley floor would be almost fully resorted to its original state. And San Francisco could still get plenty of water. 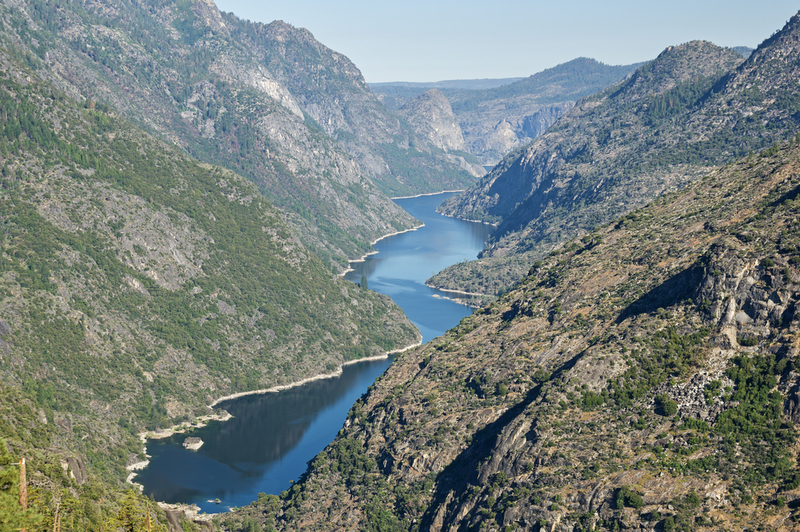 The movement to restore Hetch Hetchy to its natural state is getting stronger. Who knows – perhaps John Muir lost a battle, but his Spirit may have won a war. You and I won’t see the Hetch Hetchy Valley restored, but perhaps our grandchildren will. 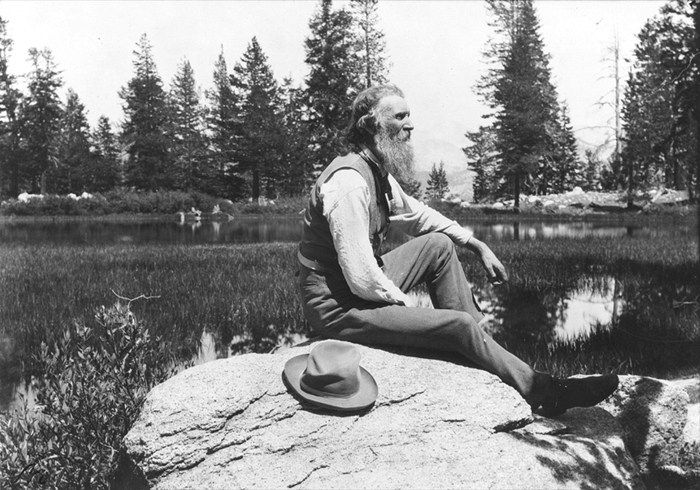 Before John Muir passed away in 1914, he released a new book of his wonderful short story, “Stickeen”. It is a story of an adventure he had with a special dog, that he told many times over the years at campfires in the Yosemite Valley. Eventually, Muir wrote down the story and it was published under circumstances that made him unhappy. The last edition, published just before his death, was to his satisfaction. I recorded and published this version as a Listen To Read Audiobook and it is available here on our website, as well as at Audible.com, I-Tunes.com and Amazon.com.